In June 2016, 72 new emojis were released as part of Unicode 9.0. Recent history would have suggested that the next new emojis would be coming in June 2017 as part of Unicode 10.0. Not this year. 88 new emojis are coming, and these form a second "emoji only" release for Unicode in 2016. Above: New professional emojis focussing on women, but also available for men. Image: Google. Most major vendors are expected to implement support for the 72 new Unicode 9 emojis throughout the remainder of 2016. Above: 72 new emojis released June 2016, already coming to major platforms. Generally, any new emoji discussion that arises between Unicode releases is channeled into technical reports and proposals, preparing for the next release. In this case; Unicode 10.0 in 2017. This year is different, and the details are worth following. A new document titled Gender Emoji ZWJ Sequences was published last week which takes the previous Expanding Emoji Professions proposal from Google and adds gender options for other (non-professional-related) emojis as well. This is the result of a directive at the Unicode Technical Committee Meeting in May for vendors to work together via the Emoji Subcommittee to reach a list of agreed characters to support. Rather than have two or more documents attempting to address the Emoji Gender Gap, this work combines all gender-related work into a single list. While the genesis of the work on this document was in ensuring women are better represented in emoji, all additions apply equally to men. Above: Female and male versions of existing emojis are included. Image: Google. The implementation for these characters is proposed as Emoji ZWJ Sequences. Here is the full list of 88 new Emoji ZWJ Sequences being suggested. This has been sourced from this spreadsheet which is linked from the main Gender Emoji ZWJ Sequences document. 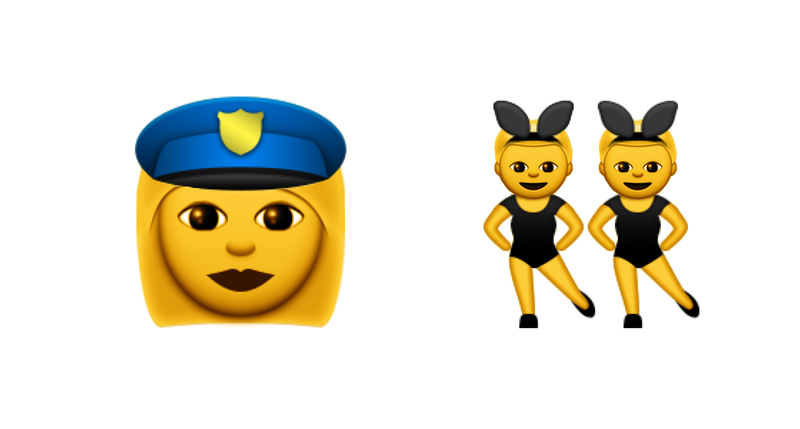 Mockup: Female version of 👮 Police Officer and Male version of 👯 Woman With Bunny Ears. This list is not final, and additions may be made prior to vendors adding support. The actual Emoji ZWJ Sequences aren't supported yet, meaning you are seeing the individual emojis inside the sequence. ♀ female sign and ♂ male sign are listed as emojis and not just regular Unicode characters, which isn't yet supported. If implemented by major vendors, the above list will display the relevant emoji next to each entry correctly in future. "Male police officer" in the above sequence is explicitly male. This paves the way for the current 👮 Police Officer emoji to become gender neutral, if vendors wish to do this. The same applies to "Woman raising hand"
If vendors wish to, they can then make 🙋 Happy Person Raising One Hand gender-neutral. All human-looking characters in the above list would also support modifiers for skin tone. When modifiers are included, the above list of 88 new emojis becomes 514 new sequences. As with other Emoji ZWJ Sequences, there is no need for any formal approval from Unicode for vendors to introduce these characters. With that said, it makes sense for vendors to consult with one another before releasing new sequences, so that (for example) Google doesn't introduce 👩+🏫 to mean "female teacher" while Apple uses 👩+🎒. The stated goal of this document is to have vendors add support "before the end of 2016".